Integrating technology helps to streamline processes and communications, and in the health care industry, streamlining is a top priority. The field of health informatics manages the processing and maintenance of health care information in a computerized system. With a master’s degree in health informatics, you’ll qualify for high-level health service management jobs. Careers in health informatics are some of the highest-paying jobs in the medical field. How much you make depends on a number of factors including education level, years of experience, and certifications. Going back to school is a big decision, but the rewards are well worth the effort. If graduate school is on your to-do list, it’s important to know what your degree will be worth in the marketplace. The information below will help you assess your earning potential and marketability in today’s career environment. The Bureau of Labor Statistics profiles medical records and health information technician jobs available to candidates with the least amount of college education. With an associate’s degree and the right certifications, you can make a median annual wage of $30,610, roughly half of what a bachelor’s or master’s degree will earn you. While company, location, and benefits often change, your experience and education level can greatly influence your salary. The more experience and education you have, the more responsibilities assigned to you. Remember, cost of living will be much higher in cities than in rural areas, so take this into consideration when determining where to work. In 2006, there were 262,000 medical and health service managers in the United States, and this number is expected to rise by 16 percent by 2016, which is faster than average for industries across the country. Those indicating consulting services ($81,561), integrated health care delivery systems ($73,615), and non-provider setting ($68,683) report the highest average salaries. 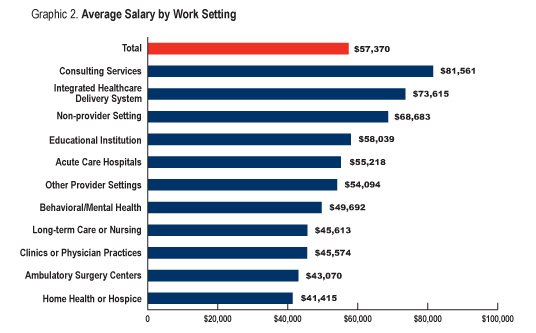 Home health or hospice ($41,415) and ambulatory surgery centers ($43,070) are at the low end of the salary scale. Years of Experience: Like most professions, experience often means higher wages. The longer you work for an organization, the larger the paycheck. Job experience also influences promotional decisions and can be used as leverage when requesting a raise or negotiating salary. Area of Specialty: Specialized work typically commands a higher rate of pay, as you’ve seen by the discrepancy in pay between health informatics technicians and health informatics managers shown above. Education: Again, there is a vast difference in pay between a person who has an associate’s degree and a person who obtains higher education and works at a managerial level. Job experience also plays an important role in determining annual earnings. If you have a few years’ experience in the field and an advanced degree, you’re at an advantage. Employers often seek candidates with internship or on-the-job training. If an internship is the only experience on your resume, don’t be discouraged. While previous experience is a plus, it’s not always necessary. Entry-level jobs in health informatics are out there and provide the necessary training to advance in the field. Once you’ve acquired experience, you can expect higher compensation. However, make sure your resume clearly reflects your professional achievements. A resume is the first line of contact with an employer. In order to attract their attention, consider the following resume tips to ensure you get the starting salary you want. List educational background with degree attained. List certifications and licenses, if relevant. Describe all work experiences including specific duties and responsibilities. Quantify your skills, achievements, and accomplishments with examples. Education programs in medical, nursing, and health informatics are growing at a rapid pace. Informatics is an emerging field that has experienced tremendous growth in the past decade. As a result, informatics programs are widely available. You can pursue a degree in this field at the associate’s, bachelor’s, master’s, and doctoral levels. Employers often consider your education level when determining salary. The average salary for medical and health service managers, including those who only have bachelor’s degrees, is $88,750. The top 25% make an average of $104,120 annually, while the top 10% make an average of $137,800 annually. With a master’s degree in health informatics, your salary will likely be higher. Online Programs: Does the school offer distance learning courses to accommodate busy schedules? Financial Aid: Does the school provide grant, scholarship, and other financial aid to qualifying candidates? Career Assistance: What types of career services are available to students such as job fairs, internship programs, and other career-related resources? Accreditation: Is the school accredited, and if so, by which accrediting agency? If a school is accredited, offers the right degree program, and provides job-related services and training, you’ve likely picked a good match. It’s important to research as much as possible about a school before enrolling. If you want to work in the health informatics technical field, you can start with the minimum of an associate’s degree and a Registered Health Information Technicians (RHIT) credential. Most employers prefer to hire credentialed medical record and health information technicians. A number of organizations offer credentials typically based on passing a credentialing exam. The American Health Information Management Association (AHIMA) offers RHIT credentialing. To obtain the RHIT credential, an individual must graduate from a two-year associate degree program accredited by the Commission on Accreditation for Health Informatics and Information Management Education (CAHIIM) and pass an AHIMA-administered written examination. In 2008, there were more than 200 CAHIIM-accredited health information technology colleges and universities programs. Experienced medical records and health information technicians usually advance their careers by obtaining a bachelor’s or master’s degree. Technicians with a higher degree can advance and become a health information manager. A master’s degree in health services administration, long-term care administration, health sciences, public health, public administration, or business administration is the standard credential for most positions in this field, according to the Professional Association of Healthcare Managers (PAHCOM). Hospitals and other health facilities offer postgraduate residencies and fellowships, which are usually staff positions. Graduates from master’s degree programs also can take jobs in large medical group practices, clinics, mental health facilities, nursing care corporations, and consulting firms. A factor in your success could be your level of participation in supportive groups, such as PAHCOM and AHIMA. Both groups are ideal for health informatics managers to use for networking and for career job searches. If you want to advance your career in health informatics, education and experience are essential to securing a higher position in this field. Although salary level varies based on a number of factors, a master’s degree in health informatics can provide you with a respectable salary and a promising career.